Ball-point, marker & white gel-pen on brown paper, fooled with in Photoshop. This turned out great. I love the dainty little legs sticking out under all that silky fur. 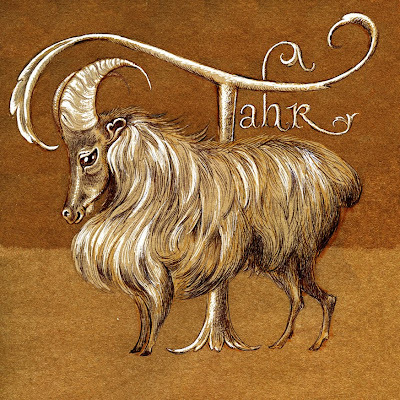 I'm glad somebody did a tahr. I had a hard time deciding between drawing a tahr or a takin. I had never heard of either a tahr or a takin before today! Apparently I need to brush up on my Himalayan hooved animals. Get this (form Wikipedia): "the Himalayan Tahr remains relatively widespread in the Himalayas, and has been introduced to the Southern Alps of New Zealand, where it is considered a pest animal and is hunted recreationally."